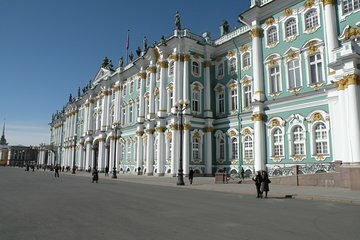 View the State Rooms and art treasures of St. Petersburg's Hermitage Museum on a 3.5-hour private tour. Avoid the crowds as you skip the line and explore the opulent Winter Palace, the winter residence of the Romanov Tsars. Ogle the lavish chambers including the Great Throne Hall, and explore the art highlights, seeing works by greats such as Michelangelo, Rubens and the Impressionist masters. Focus on the areas and art of most interest to you: as a private tour, the itinerary can be tailored around you. Andre is very knowledgable about the contents and routs in the Hermitage. We went on a day of unexpected crowds, but he managed to guide us through a rout that avoided many of the congestions. His historical background information is deep and thoughtful too. Highly recommended. Tour started with the paintings from the Impressionist era in the Staff Building which was appropriate since one needs one's mind fresh for viewing this type of art and the guide was very informative. Then on and the Guide knew best order and which rooms to see in Hermitage. After official tour ended, I stayed and roamed on my own to visit the rest of Hermitage that had been skipped remember it is huge and always consult your map to avoid getting too lost. The only reason I did not give a 5 star is that I would have preferred starting a bit earlier I like to be at the entrance five minutes ahead of opening time. Also it was very good to have ticket purchased as part of the package. Overall I am happy with the service.